Our son Eldarion Love was born October 5, 2011, our fifth baby and fourth boy. He was immediately taken to the NICU because of concerns about his oxygen levels. My husband Michael and I didn’t get to hold our baby for nearly two days. 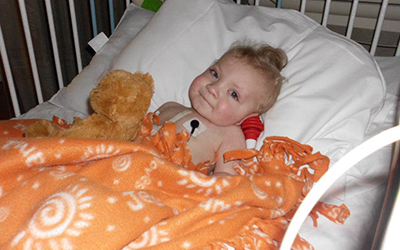 One of the nurses nicknamed him “Squishy,” for the “squishy” sound his heart made when it pumped. The name stuck. We learned Squishy has a missing gene, 15q22. He also saw a heart specialist, who recommended we take him to Riley Hospital for Children for surgery to repair his ASD, VSD, and pulmonary stenosis. Surgery was tentatively scheduled for when he turned two. Squishy struggled to meet milestones, but he is the youngest of five wild children, and we believe that one of his greatest motivators was watching his siblings. His doctors and therapists exclaimed he was the worst case of hypotonia they’d ever seen, who could do as much as he could. Shortly after Eldarion’s first birthday, he began to tire easily, and his hands and feet looked purple. We took him to the emergency room one night, and the doctors opted to fly our Squishy via helicopter to Riley Hospital right then. I cried during the whole two-hour drive to Indianapolis. When we got to Riley, all the staff were wonderful. They knew while it was just another surgery to them, it was THE surgery to us. When we saw Eldarion after surgery, his feet were the most beautiful, PINK feet I’d ever seen. The doctor told us he had decided to fix all three of the heart defects instead of leaving one to correct itself. Squishy would never need another heart surgery. Our time at Riley was the best I’ve ever had in a hospital. Each and every person understood our worries and empathized with our concerns. The music therapist let Squishy borrow her “quack stick” because he loved its sound so much – he even fell asleep with it one night. When Eldarion was cleared to return home, he got to ride through the hospital in a wagon. Once we were back home, Eldarion’s energy levels skyrocketed. Today, he is a kindhearted kindergartner. 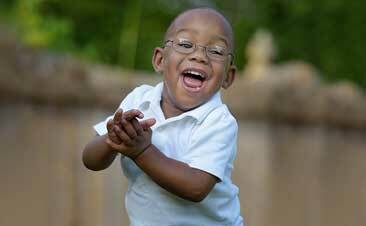 He is at least a year behind in everything from size to milestones, but he is years ahead in his ability to make his own joy and in his determination. Squishy brings happiness to every life he touches. With five kids, you can imagine how many times we’ve dealt with hospitals. Riley was unlike anything we’d experienced before – or since. Melany Love works as a real estate agent for RE/MAX Integrity in Columbia City and a part time substitute teacher for Columbia City and Whitko schools. She and her husband Michael have been happily married for fifteen years , and they have five children – Endymion (13), Bastien (12), Caspian (10), Estara (8), and Eldarion (7). The Love family enjoys fantasy movies, TV shows, and tabletop gaming, and their favorite hobby is LARPing (Live Action Role Play).